Talking about my favorite food, absolutely Seafood! I love it so much. various creatures e.g. fish, prawn, squids, crabs, and others friends. 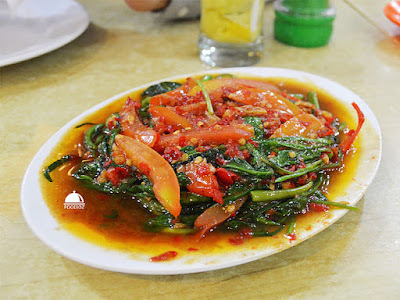 This time i try seafood for my dinner at Pondok Pangandaran at Greenville, West Jakarta Area. Actually i had another branch at Kelapa Gading quiet time ago. These time, Greenville has become one of restaurants street in town. Many opening new spot either local or international foods. During weekend, this area have lot of car park around though. Good thing, there's left one space while others keep looking for parking lot. This restaurant has average place i think, like family restaurant, not a small place, but it does looks just fine, from wall painting, chairs and tables it just ok, nothing really beautiful i can say :-). In fact, it seems this restaurant has been runned by family management. It has quiet many customers, very noisy and loud both of customers and even the waiters or services back at the kitchen. we may hear loud voices from everywhere. I start order for my dinner by Pangandaran Prawn, Grilled Squids, Morning Glory with shrimp paste and glass of mango fushion water. I can tell, prices of menu is good. commonly we need to spend quiet much for seafood especially for prawn. But in here, i assure you it is happy by look at the price. First came out is morning glory with shrimp paste. it is good from it smell, nice color of shrimp paste looks spicy and absolutely smell tasty. It served along with slices of tomato around the top. Actually it is taste good, veggie is perfectly seasoned, strong shrimp paste made really authentic taste and spicy well done. But tomato is unnecessary i think, what a sour has become really strong and bit covered up the shrimp paste flavor. Next dish is Prawn Ala Pangandaran, which i asked before to the waiter, it is similar with prawn padang sauce, and he's not really sure what difference of these two dishes :-D. As it sounds interesting, Prawn cooked by their own style, so i ordered it. It does tempting me alot when served on my table. 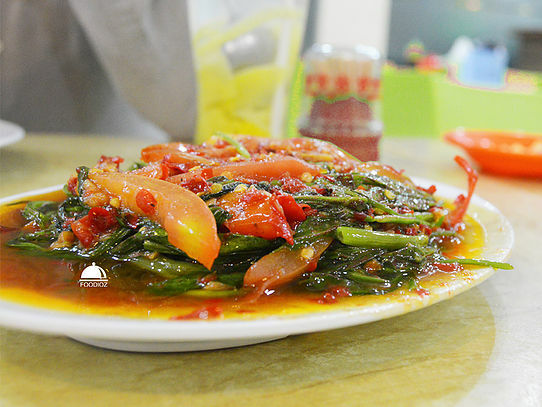 Thick red color shows spicy flavor, and bunch of fresh prawn is absolutely fabulous. 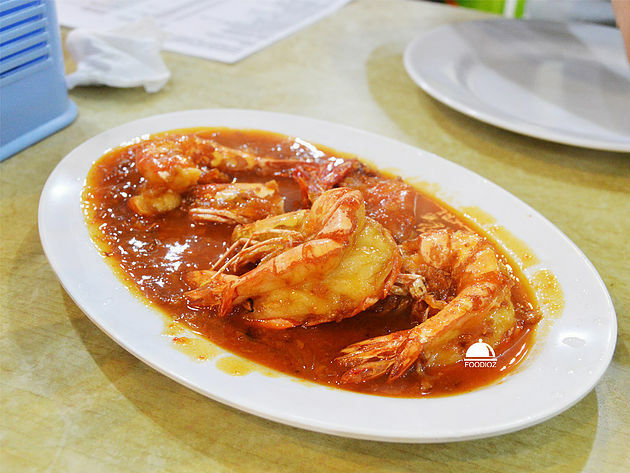 Prawn taste really good, nice cooked texture and sauce is spicy. I am not sure what does really different with Padang sauce. But overall this dish is recommended there. 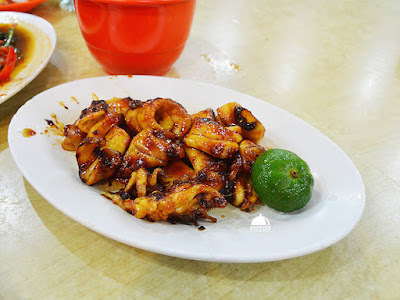 Last dish i had is Grilled Squid. It looks grilled well done with soy sauce i assume. 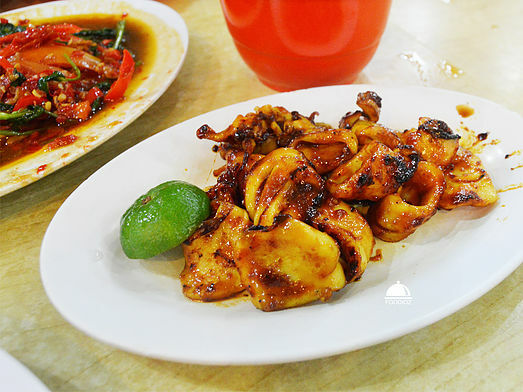 It served with slice half of lime, most people like it to give anoher flavor to seafoods and quiet reduce fishy smell. The squids has good texture, grilled nicely. After finished dinner, should be closed with cold fresh drink. so i order Mango fushion water sounds interesting. It is beautiful color, and mango looks nice. But what it taste just sugar water with slices of mangos, and i think it's just pickled mango that we may buy at the supermarket. No matter, cold gave me a pleasure after finished my foods.